Due to the special optical environment of the ocean, when the light propagates in the underwater scattering medium, the different characteristics of different wavelengths cause the image acquired by the sensor to have color distortion, visual blur and contrast reduction. Images are important carriers of marine information. In recent years, scientists have conducted a lot of research on underwater imaging. Compared with the high cost of improving imaging system equipments, digital image processing is more flexible, simple and easy to implement. Prof. Ping Yang’s group from Institute of Optics and Electronics, Chinese Academy of Sciences, worked on adaptive optics and image processing algorithms. They proposed a restoration algorithm for underwater images with too much red component attenuation. In cooperation with Yantai Institute of Coastal Zone Research, Chinese Academy of Sciences, the researchers analyzed typical images collected in the Bohai Sea. They used the different attenuation and scattering characteristics of different wavelengths to restore the intensity information in the red channel by weighted compensation. Guided filtering is used to recover the edge information in the red channel. Then the dynamic range of the image is stretched to enhance the contrast. The restored image is natural in color and the overall contrast is improved by more than 2 times. The algorithm can realize real-time processing of 1280810 resolution video on the hardware platform. 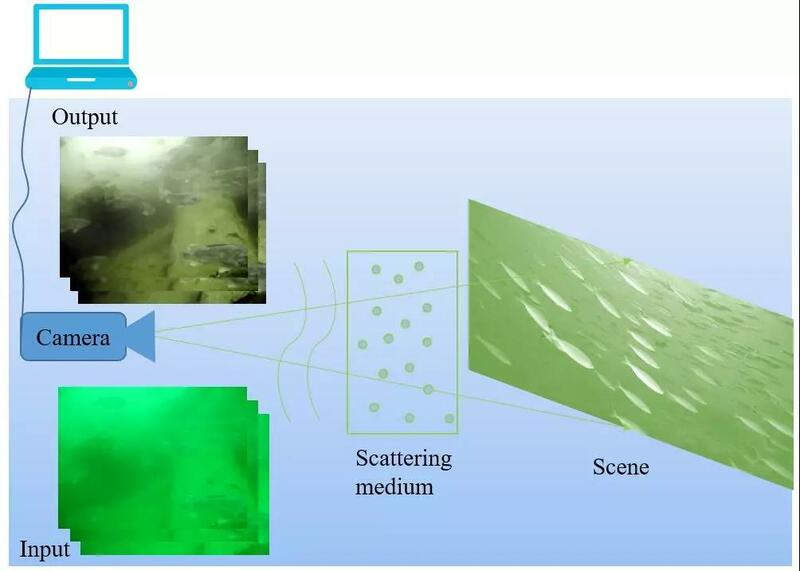 Underwater imaging technology is widely used in underwater target detection, marine geotechnical engineering and marine resources exploration. This technology has extremely broad prospects in the application of underwater vehicles. The research fields of Prof. Ping Yang’s group include adaptive optics, optical imaging and image processing. Recently, the group got research funds from National High-tech R&D program of China, National Natural Science Foundation of China and National Programs for Science and Technology Development. Prof. Yang is the 12th Outstanding Youth of Chinese Academy of Sciences and the first recipient of the National Defense Excellence Science Fund. He served as the editor of Chinese Journal of Lasers. Prof. Yang has published more than 110 academic papers. He has been granted more than 50 national invention patents and has co-authorized two English monographs.